Well, they won! Did anybody expect anything different? I stayed off social media and the internet until I had a chance to watch it later. The plan was working just fine until my sister texted me, how did the US already win, when it hasn't been on TV yet? The older one, not the younger one who went to Olympic Trials with me. She knows better. I wasn't too upset, because I figured they would win anyway. The only thing I didn't expect is that they would do even better than in qualifications. Winning by 8 points, they could have counted falls and still won. 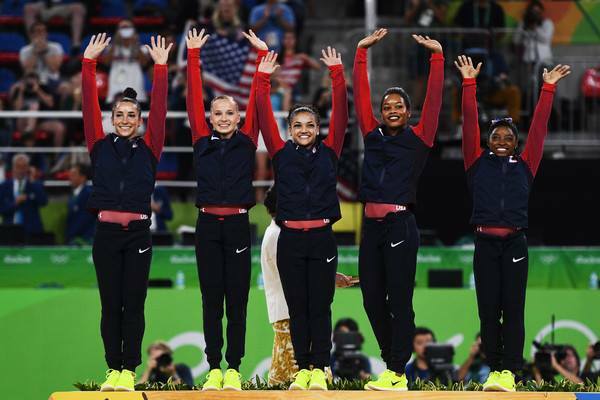 They won podium training, qualifications and finals not missing a single routine in the entire Olympics. They are like machines! I don't know how they do it and if I were the other countries I would be so annoyed right now with their brilliance. The same way, everyone else used to get annoyed by USSR and Romania for winning everything all the time. The three per country rule was changed to two per country after Romania swept the all around in the 2000 Olympics. I remember the 1988 Olympic in Seoul, Korea when Phoebe Mills winning a bronze on balance beam was the biggest deal ever. The US couldn't crack the podium in a non-boycotted Olympics back then. Brandy Johnson placed 10th all-around and it was the highest all-around finish ever for the US in a non boycotted Olympics. The US team finished 4th that year. In 1984 the US won a team silver and Mary Lou Retton won the AA Gold. Those were both very important, but it's kind of sad that it almost doesn't "count" since the Soviet Union wasn't there. My how things have changed. Romania didn't qualify a team to the Olympics for the first time and the only former USSR country that can keep up is Russia. In the perfect storm of the right gymnasts coming together at the right time, the US won Olympic team gold in 1996, but fell down to bronze in 1992 and 2000. Marta Karolyi stepped in as national team coordinator in 2001. They inched their way up to silver in 2004 and 2008, then back on top with gold in 2012 and now 2016. The US has been on the Olympic podium since 1996 and the World's podium every year team has been contested since 1991 with only two years they didn't make the podium (1997 &1999). As a team USA has always been pretty good. There was a large gap between the top few teams and everyone else and All-around and event final medals were few and far between. They were never bad, just not the consistent multiple medal winning dominant power house they are now. The semi-centralized system put in place has made all the difference. Not just because of the intense training they receive at their monthly week long visits to the ranch, but because working together as a cohesive unit over the long term builds bonds integral to team success. Before the system was put in place the girls trained at their home gyms, and saw each other at competitions a few times per year. They got a little more time together, training for a few weeks before major international competitions before going their separate ways again. They were individual gymnasts thrown together for a few weeks out of the year. I distinctly remember the perfunctory half hugs shared between Kim Zmeskal, Shannon Miller and Dominique Dawes during the 1992 Olympics in Barcelona. Half the time they didn't even watch each others routines. The teams from Romania, USSR, and China lived together and trained together. They were so close and you could see it in the way they interacted with each other and rooted for each other. I still remember Tatiana Gutsu crying in the arms of Svetlana Boguinskaia after she fell on beam in. It was the stuff that gymnastics fluff dreams are made of. They were like sisters. Training side by side with the best of the best on a regular basis also makes them push themselves harder, and this makes them all better. There is criticism that they are pushed too hard at the ranch, there are too many injuries, and the selection process is not fair, but it's working. Maybe they can find a happy medium somewhere moving forward. As if it's not hard enough to make the team, the next Olympic teams will be whittled down to four. 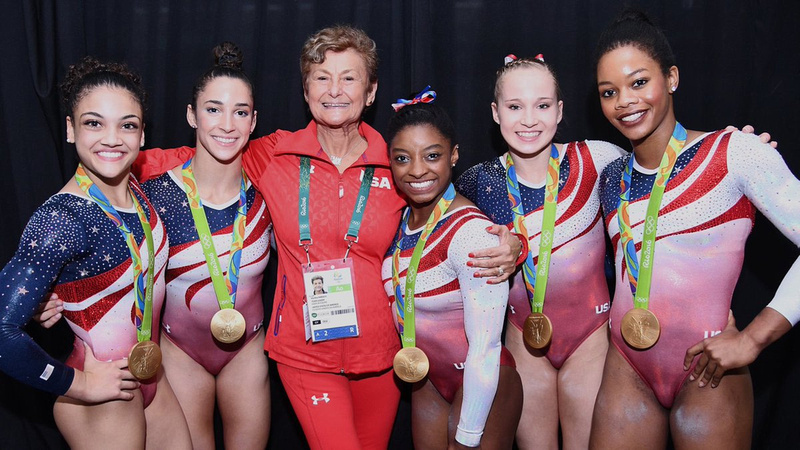 The Final Five gave Martha Karolyi the best send off she could have ever asked for. Her time as team coordinator has come to an end, but I hope that team USA excellence will continue. I watched 25 minutes of it as it was on-- or however long I had for free on the app, haha-- but later my husband was telling me it was going to be on, and I was like no they already went! It was so crazy/cool to hear about how the "worst" US athletes would be considered the best if they were with another country. Thanks to your blog posts, I have watched a lot of gymnastics this time. Your posts really helped me to understand the sport and properly root for the home team. The All-Around Conodrum post was super helpful. Good job Gymnastics reporter! I sooooo wanted to see it on my own but one of the other attorneys in my office ruined it for me. I've watched every Olympics since the 92 games and I wasn't even a teenager yet but I was so wrapped into their stories and events. And youre right the unity wasn't really there back then. But I do just remember being obsessed with Betty and Dominique. I'm glad the girls seem closer. The Gabby criticism is still irking the crap out of me though! Love this post!! I agree that semi centralized program has worked. I do like the how the girls are all friends and really root for each other. Is it kind of weird that sometimes I wish it was like it was back in 92 or 96? I think there was more excitement to the sport back then. Any word on who the head B in charge will be now that Marta is gone? How do you feel about team of 4 from now on?